This gambrel-roofed lakeside cottage is casual but spirited, with an open plan linking the central kitchen to both dining and living areas. The master bedroom is secluded behind a massive stone fireplace, and the study is tucked away behind a striped wooden étagère, atop which sits a reading loft. A two-story, stone-floored screened porch just off the dining area welcomes guests. 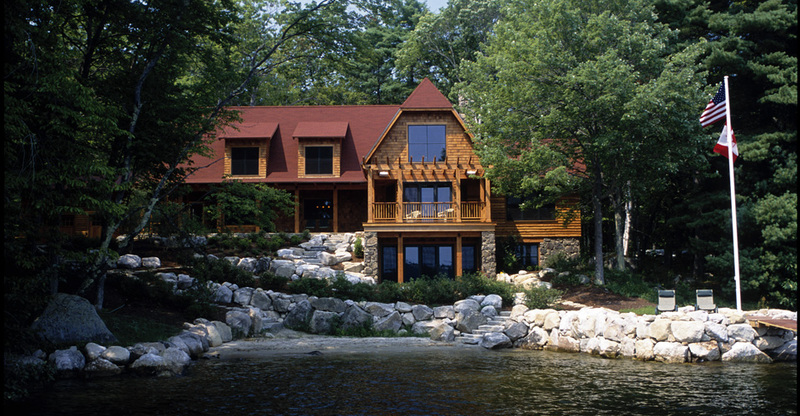 The lakeside length of the house carries a deep overhanging roof, providing several reading nooks both inside and out. 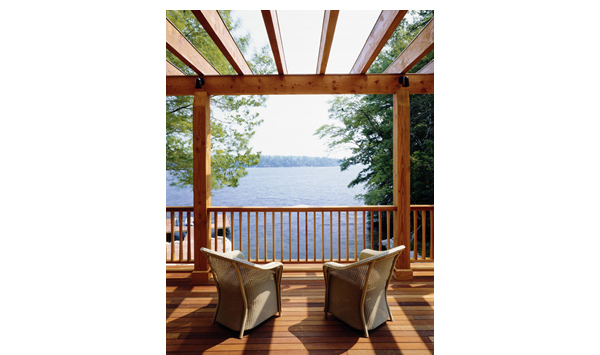 A sundeck thrusts from the living room out to the water, with timbered trellis overhead; beneath, the lower level’s glazed doors open to a stone patio at water’s edge.